Aperture Blades: How many is best? The short answer is that the more blades an aperture has, the better. However, that short answer needs (a lot) of clarifying to be totally true. You probably already know that the aperture of your lens affects depth of field. If you shoot at a wide aperture you will have a shallow depth of field. That shallow depth of field allows you to shoot photos with sharp subjects and soft, blurred backgrounds. When your subject is isolated from your background like this it gives them pop and significance. The quality of the out of focus portion of a photo is called bokeh (pronounced bo-cuh). The bokeh, however, can be smooth and non-distracting or crunchy and off-putting. The number of blades that make up your lens’ aperture are what makes the difference between pleasing bokeh and poor bokeh. The aperture of your lens is opened and closed mechanically, and operates like the pupil of your eye. It can be opened wide, or shut down to a small circle. When your lens is shot wide open your bokeh will always be circular since the aperture blades are retracted into the lenses housing. When you start to close your aperture down, however, that’s when the blades come into play. Some lenses have only 5 or 6 blades on the aperture, and other lenses may have 9 or even 14 blades on the aperture. In less expensive lenses, it is most common to see 6 blades in an aperture, and in more professional lenses it is more common to see 9 blades. Aside from the sheer number of the blades is whether they are placed straight or if they are rounded. In the comparison below, you can see that the rounded aperture makes a shape closer to a circle than the other aperture that forms a pentagon with hard corners. 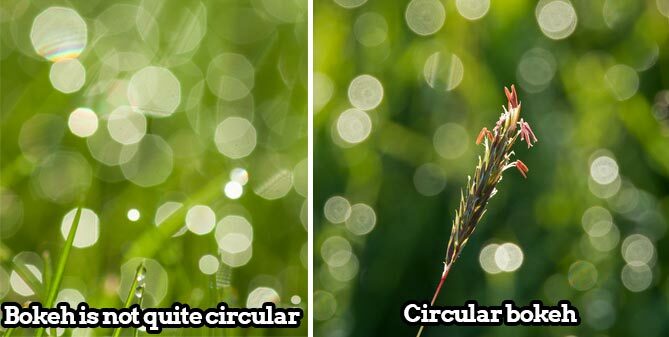 While it may not make much difference to some, most photographers prefer the rounded aperture so that the bokeh appears smooth and circular. The lens on the right with more blades, which are rounded, is generally preferred among photographers. Think about it this way, if your camera has 5 aperture blades as they start to close they form a circle with a slight pentagon shape running around the edge. As a result, the out of focus areas take on the shape of soft pentagons instead of the soft circles photographers desire. If you have more blades, as the aperture closes, it’s closes into a shape much closer to that of a perfectly round circle. So what’s the ideal number of blades to have? Most agree that 9 blades are about perfect, but it's a matter of personal preference. Some photographers are quite picky about the shape of the bokeh, and others could care less. Indeed, high end lenses, like Canon and Nikon’s 24-70 f/2.8 both have 9 blades. These lenses are generally regarded as the cream of the crop when it comes to smooth bokeh. The least desirable lenses in terms of bokeh typically have 5 aperture blades. The bulk of consumer and mid-grade lenses usually have 7 blades. Overall, the lenses that produce the best bokeh had 9 rounded blades. The worst have 5 straight blades. Most lenses fall somewhere in between, with 7 rounded blades. If your lens has 5 blades, does that mean it’s time to sell it on eBay? Of course not, keep shooting with that lens and pay attention to the bokeh it produces, while realizing that for the most pleasing bokeh you will want to invest in a lens with more aperture blades. If you’re looking to save some money, consider picking up a prime lens with at least 7 rounded blades.